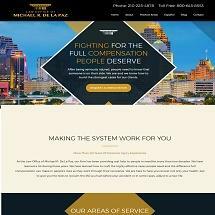 At the Law Office of Michael R. De La Paz, our firm has been providing real help to people in need for more than two decades. We have learned a lot during those years. We have learned how to craft the highly effective cases people need and the difference full compensation can make in people's lives as they work through their recoveries. We are here to help you recover not only your health, but to give you the tools to reclaim the life you had before your accident or in some cases, adjust to a new life. As you work through your recovery, medical bills will pile up and lost wages will deplete your savings. At the same time, the insurance companies are going to be working to deny your claim or minimize their responsibility for what happened to you. Our decades of experience allow us to effectively fight the insurance companies and the resources they will throw at your case. For the best chance of ensuring that your needs are met, trust a firm with substantial experience like ours.